When a city or subdivision is developed, there is usually a plan to collect and convey stormwater runoff away from buildings. Normally, the buildings are located on a site higher than the property line and street. 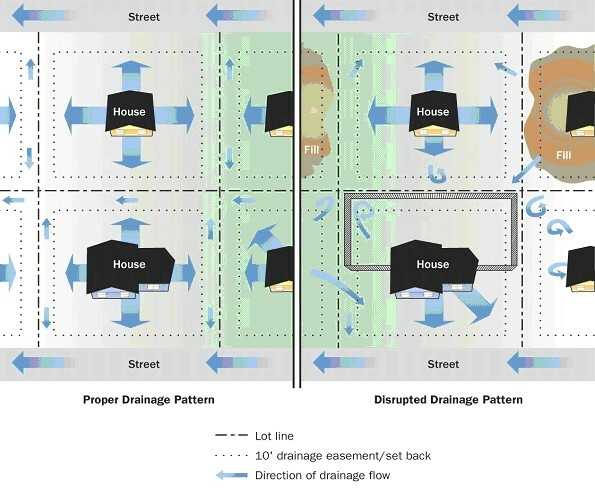 Runoff drains downhill to the property line and then on to the street or storm drains (see graphic below, left side). The drainage system then conveys the water to ditches, streams, and canals. Problems arise when the drainage system is blocked. This can be on the property itself, such as when the pathway to the street and storm drains is blocked by filling, regrading, fences, or other obstructions (see graphic below, right side). These problems can be fixed by returning the lot's grading and drainageways to their proper condition. Another problem is dumping in open drains, ditches, streams, and canals. Every piece of trash can contribute to flooding. Even leaves, grass clippings, and branches can accumulate, plug storm drain inlets and channels, or kill vegetation and contribute to erosion. If your property is next to a ditch or storage basin, do your part and keep the banks and storm drains clear of brush and debris. Do not dump or throw anything into the storm sewers, inlets, ditches, or basins. Dumping in ditches, storage basins, and wetlands is a code violation, If you see dumping or debris in the ditches or basins, filling or construction near the property lot lines, or filling or construction in a mapped floodplain without a permit sign posted, contact you local permit department. The debris or project may cause flooding on your property. Many cities and regions throughout Louisiana rely on pumping stations to remove excess water during rainstorms. To reduce the pressure put on these systems home and business owners can help reduce the total amount of storm water runoff that is produced. Stormwater runoff usually refers to rainwater or precipitation that does not enter the groundwater system and instead flows across surfaces such as roads, driveways, and sidewalks. Stormwater runoff can pose problems for communities by increasing flood risk and can carry pollutants that will then enter and contaminate the water shed. Permeability refers to the amount of liquid or gas that can pass through a solid barrier. Impervious materials such as concrete and asphalt actually contribute to increased storm water runoff by keeping rainwater from reentering the water table through the ground. Decreasing impervious barriers around you home can help with stormwater runoff and flooding. Avoid paving driveways and walkways around a home and opt for permeable solutions such as gravel, stepping stones, or cobble. Excess debris or barriers around storm drains can actually cause street flooding that can impact a home or car. Even renters can do their part by ensuring that debris such as grass clippings, leaves, and trash do not accumulate in the street. During a rain storm debris can float down a street and get carried into storm drains clogging them and making them less effective, so make sure to keep areas away from the actual drain clear as well. Allowing storm water to enter the ground and thus refill groundwater helps reduce subsidence and takes water away from homes and roads.